Injuries, unfortunately, are a part of endurance sport. We can do our best to avoid overuse injuries, but sometimes they happen anyway. For example, last summer during a ride, I reached for my water bottle at what turned out to be an inopportune time. My front wheel hit a bump in the road and I ended up with a broken elbow. If you find yourself in an injured state, there are some things to think about in terms of nutrition to aid in recovery and make sure you are in the best condition to get back into training when ready. The first thing to consider is probably the most obvious, and that is caloric intake. If you go from very active to a lot less active, your energy expenditure goes down so your intake should also be reduced. 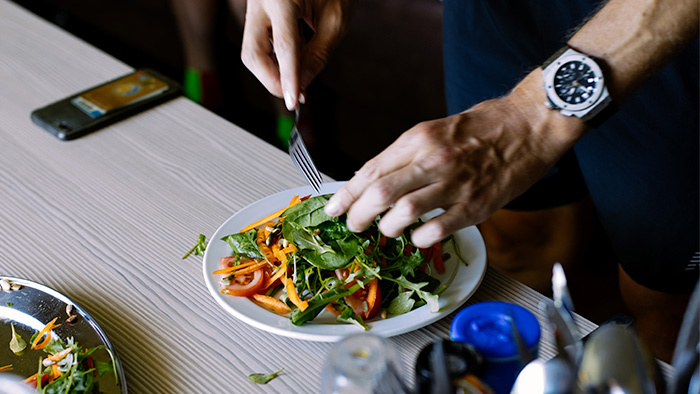 Keeping a food log for a few days can help, as you also don’t want to cut back too significantly or you could hinder the recovery process because your body isn’t getting enough energy. If you had a high training load, you might swap out some grain carbohydrate sources and replace them with a variety of fruits and vegetables. You still want a good balance of carbohydrates, protein and healthy fats, but you may not need as many carbohydrates if your training load has decreased. The next important thing to make sure you are doing is eating quality food. Your body is working to repair itself, so make sure it has the tools it needs. Depending on the injury you might need additional protein, vitamins, minerals, antioxidants, and healthy fats. Protein (amino acids) is important to build and repair tissues, help maintain water balance, form enzymes involved in cellular processes, transport substance, maintain optimal blood pH and protein is synthesized into important hormones we need. Vitamin C plays a role in collagen syntheses, and we need collagen as it is used to make skin, cartilage, tendons, ligaments and blood vessels. It also helps in the absorption of iron, and plays a role in red blood cell synthesis. Vitamin A helps keep bones healthy, and it is also needed to maintain immune system health. Vitamin D aids in the absorption of calcium and phosphorus, which is helpful if you are dealing with a bone injury. Vitamin D also helps with immune function and has anti-inflammatory properties. In short, eat a variety of fruits and veggies with your normal healthy diet, and monitor your caloric intake if your activity level has decreased. All injuries are different, and depending on what your current diet consists of, you may or may not need to modify it. Talk to a sports dietitian to learn if there are any dietary modifications that might be beneficial for your type of injury. And as always, prevention is always the best medicine! If you aren’t injured, be sure to eat to support your activity and training levels, maintain healthy bones and muscles, and support a healthy immune system. If by chance you hit that inopportune bump in the road like I did, it will be a much easier healing process and a faster return to training. If you’re looking for some important mental skills for dealing with injury, check out our TrainingPeaks University online course, “Mental Toughness During Injury: How to Regain Your Confidence and Get Back to Competition” with mental skills expert Carrie Cheadle.